Sydney based entrepreneur Danny Kim, and owner of Sushia Izakaya & Bar, launched his modern twist on traditional Japanese food in areas of regional NSW, in order to establish and refine the overall brand, giving country diners a totally new and more diverse experience. With Sushia Roll and Fresh Bars in Taree, Orange, Bathurst and Port Macquarie successfully implemented, award-winning JNP Architects were commissioned to complete a stunning yet versatile fit-out for the more elaborate Bond Street location in Sydney’s financial hub. 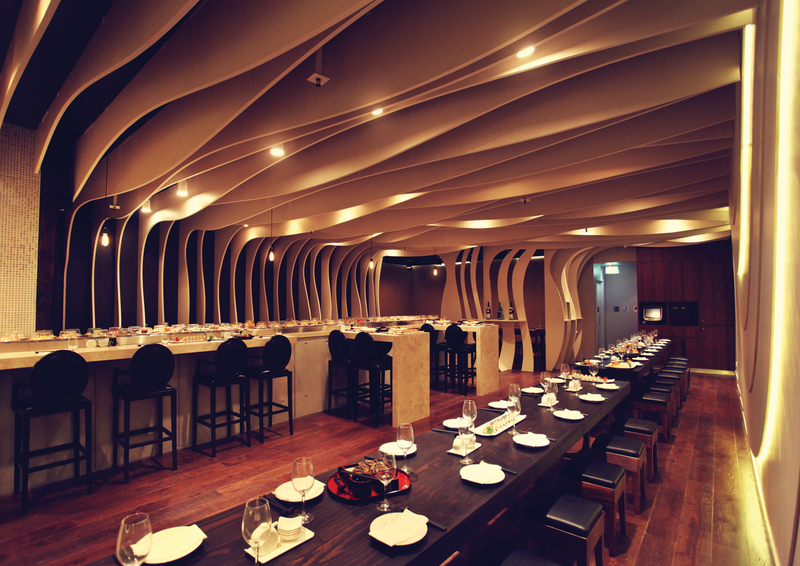 The innovative timber fins dominate the aesthetic of the main room, with the nuance of the more subdued lighting suspended above the sushi train providing a nice counterpoint. Similar outlets are planned for Perth, which currently has a Sushia Roll and Fresh Bar like Sydney’s in Greenwood Plaza and Chifley Square, and in the ACT. With outdoor seating adjacent to the bar, and an elegant PDR supplementing the main room that houses the sushi train, the experience is totally dependent on your dining mood and budget (currently ranging from $3.70 on the sushi train, to $34.90 for the sushi and sashimi platter from the menu). There are large platter options for party and corporates between $65 to $85; which considering the quality and quantity of the seafood, appears very reasonable. 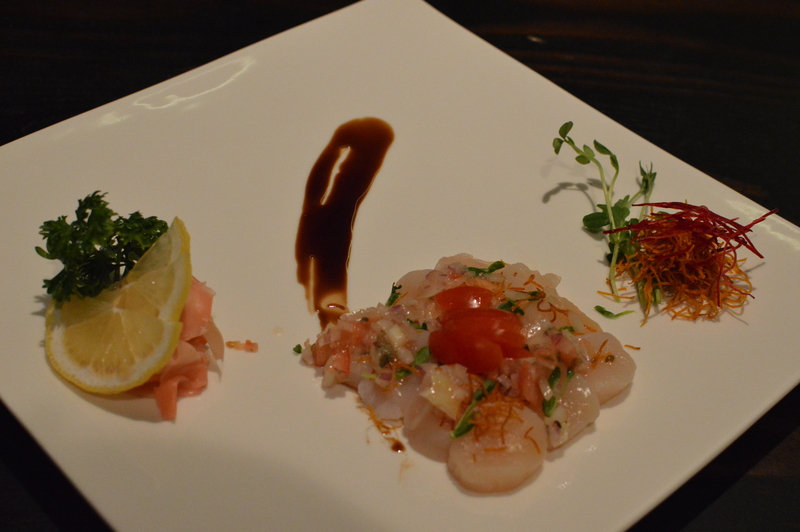 Starting with the nicely presented Scallop Carpaccio (or ceviche), which represents incredible value at $12.50, given the generous portion of fresh and texturally appealing molluscs. The zingy mouth feel from the preparation is cut across by a rich and unctuous glaze, giving the dish the necessary balance and a point of contrast. It is impossible to resist the lure of the sushi train, and the spider roll ($6) seems a good option from the large selection, with the soft shell crab delivering delicate flavour and nice texture. 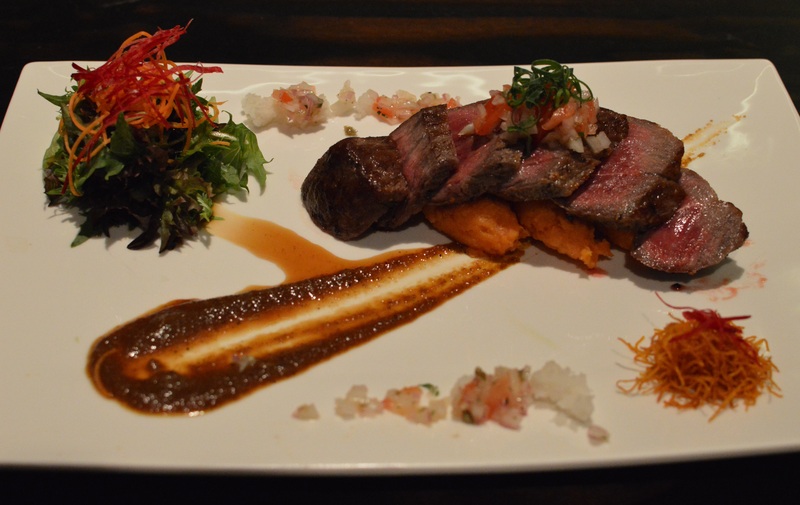 What I observe looks well executed, and at a good price point, but I choose to focus on the main menu to experience the full repertoire of Chef Scott Lee. 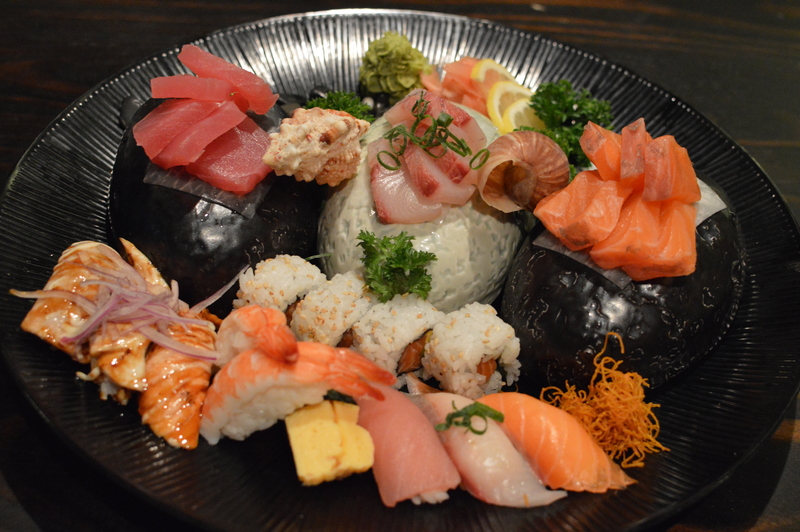 The sushi and sashimi platter ($34.90) is mandatory, with tidy knife skills showcased throughout the multiple elements, which are both faultless in freshness and provenance. The 2006 Henri Grandin Crémant De Loire ($50) offers some nice bottle-aged complexity, without losing its vibrancy from a list that is predominately local (apart from the Sake). The list strikes a nice balance between current and back vintage options, without emptying your pockets in the process. I sample the Nihon Sakari SMV +3 ($9/180mls), a pure rice sake, which is semi dry and quite fruity on the palate. The deep fried Agedashi silken tofu ($8.50), once again portioned in the diners favour, has quite a thin batter but is both sweet and rich. The almonds provide an intelligent layer of texture, with the dashi sauce offering essential background complexity. 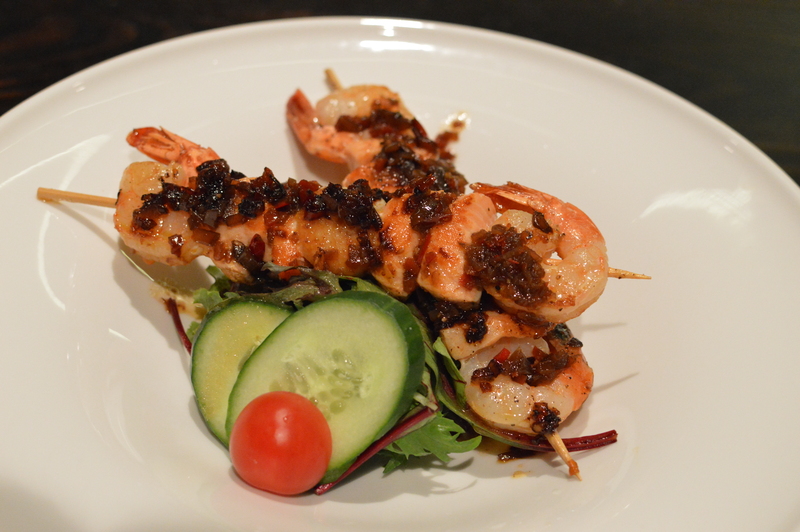 Seafood Kushiyaki, with chilli balsamic sauce ($12.90), essentially two skewers of prawn, scallop and salmon, with a nicely measured heat note that cuts across the caramelised sweetness. The salmon was a touch overdone, but not enough to detract from the overall dish. Next, prawn and vegetable tempura ($16.90) is lightly battered, featuring three nice sized prawns with carrot, eggplant, zucchini, pumpkin, sweet potato, and asparagus. Service is efficient, without being obtrusive, and well informed, which as we know can be difficult to find in this format of dining. Dish of the night is undoubtedly the 9+ Wagyu ($29.50) which is cooked flawlessly, and I would return for alone without hesitation. The dark rich sesame demi demonstrates technique, and an understanding of balance and flavour, elevating this dish to memorable. The other ‘wow factor’ is the price point, which for this level of produce and execution is quite exceptional. 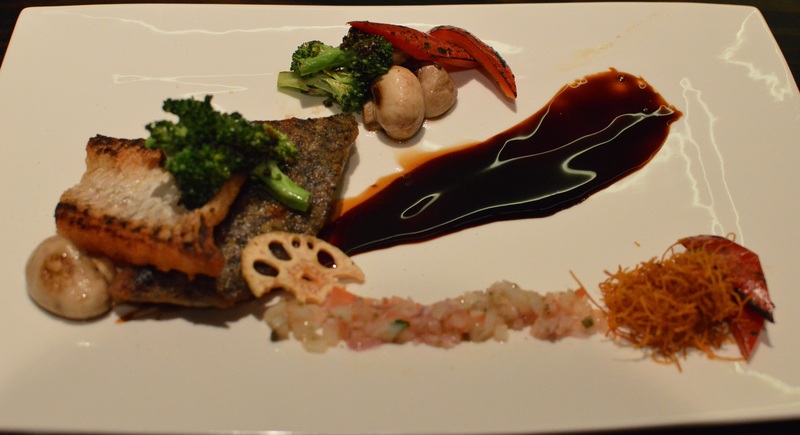 Similarly, the crispy skinned Teppan Barramundi ($22.90) is finished with a herb teriyaki sauce that lifts the dish to another level. Clearly Chef Scott Lee has a deft touch for sauces and glazes, which provide a desirable edge at this level. The Elleo Group, which has a noteworthy sustainable approach and social conscience, has allowed its Chefs autonomy, providing that essential point of difference to the format usually applied with group roll-outs. This approach, along with a commitment to provenance that is clearly evident on the plate, aligned with favourable price points, makes Sushia Izakaya & Bar both an attractive and accessible option. The Bar aspect brings the vibrancy of the outdoor courtyard into play, offering a credible alternative for those looking for a drink and a snack after work. 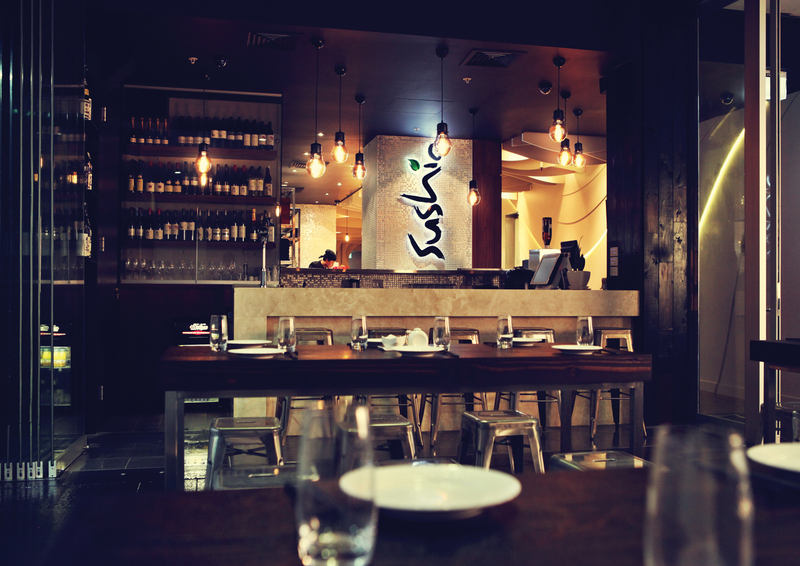 In this financial end of town not renowned for value, Sushia Izakaya & Bar is a pleasant addition to this area of the CBD. looks like you had very similar dishes to Does My Bomb Look Big In This? Can’t fault good taste mate! Actually, for the record my dining partner ordered the majority of them whilst I was busy taking pics, and he has a very sharp palate. I ordered the Barramundi at the end, which is also a very good dish, but I was more than happy with his selection as the review reflects. 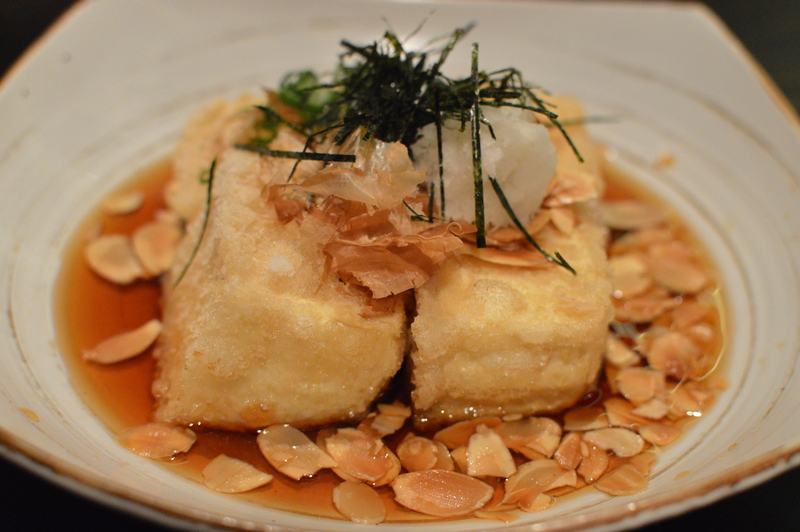 I keep seeing almonds in agedashi tofu around Sydney and am intrigued! It worked well as a textural component in that dish, so that trend is most definitely a welcome one.